This amazing WordPress themes bundle is especially crafted for music industry. The designs here are suitable for rock bands, DJs, musicians, solo singers, pianists, guitarists, etc. Some of them are also suited for promoting music festivals, parties, music events, concerts, album presentations, radio shows, and more. You can feel free to choose these themes for any entertainment related websites, and be sure to easily customize and change them up to your needs. All of them are extremely flexible and easy to edit without any coding skills. 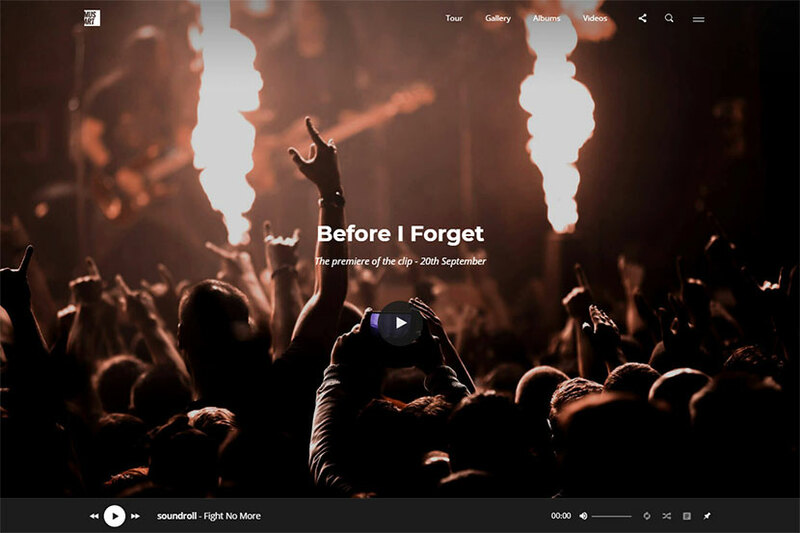 A music WordPress theme that will become a great website for a rock band, music band, talent show singer or a musician’s personal web-page. The theme comes with full-width slider, video section on the homepage, awesome gallery layout, and a lot of additional possibilities for promoting your music on the Web. You will be able to select between white and dark skins, boxed and wide layouts, use additional plugins supported by the theme and integrated into it, and create unbelievable design of your website with simplicity. A music band WordPress theme specially designed for music, band, artist, music industry, fan club website or other related experts in the same niche. 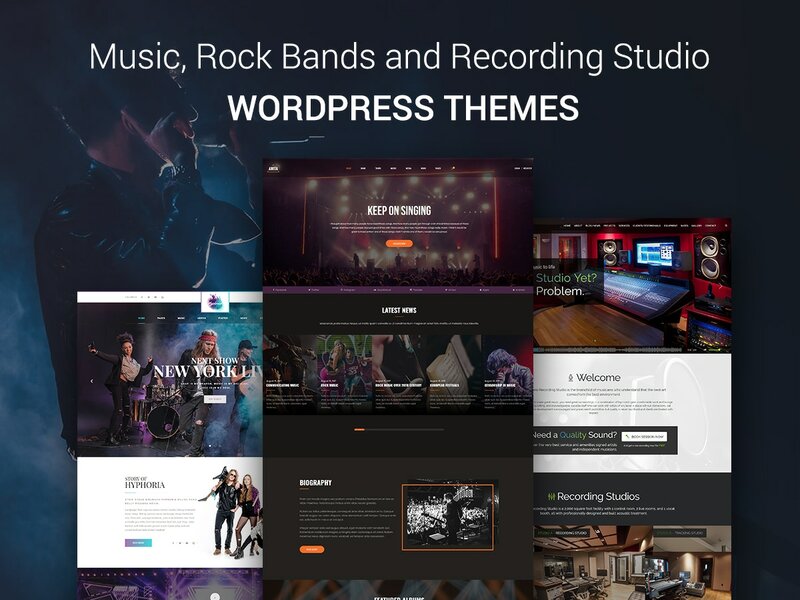 This theme can be called a great solution for any music industry related website thanks to its multiple features available for building a site with no coding required. The theme is compatible with Music Press Pro plugin, WPBakery page builder and Revolution Slider premium plugins. It includes features like light and dark versions, WooCommerce support, unlimited color options, 6 post types, and many more virtues. 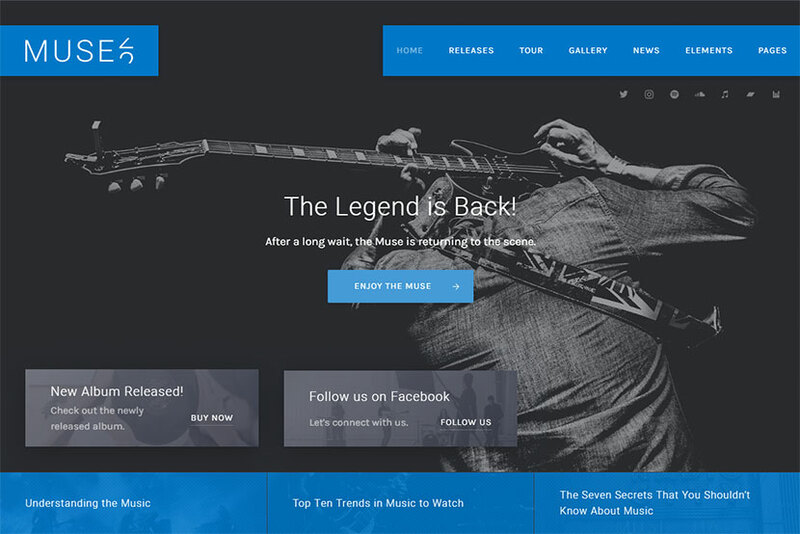 A music WordPress theme which is a complete, flexible and simple solution for the music industry. It is quite suitable for musicians, music bands, solo music artists, guitarists, pianists, drummers, bassists & artists of any music genre including rock, pop, hip hop, jazz etc. Of course it comes with WPBakery page builder with drag-and-drop interface, so you can create your unique layouts without effort. It also contains grid and slider elements, tour schedule, MailChimp and Contact Form 7 support, teaserboxes, counter, compatibility with a number of music shop platforms, timeline element, and many more coolest features for building a music website. 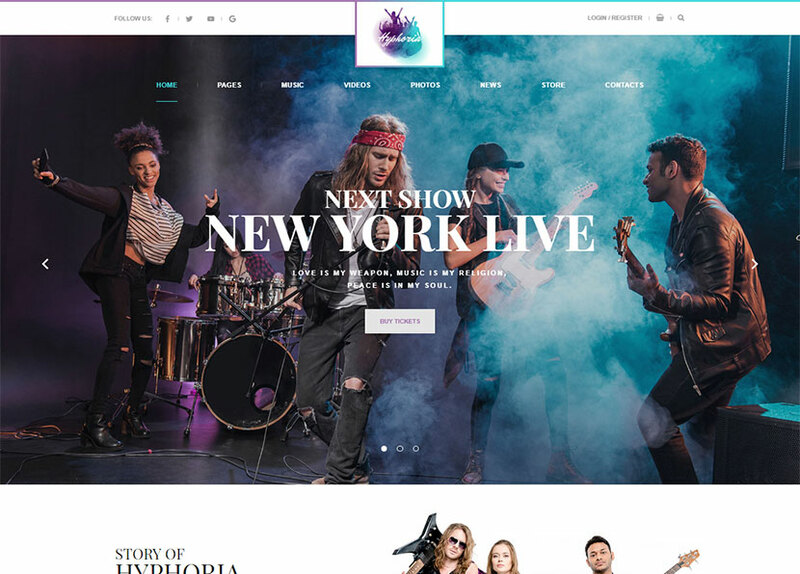 A vibrant and modern WordPress theme crafted for musicians, artists, and anyone working in the entertainment industry. The template is designed with terrific attention to details, unrivaled flexibility, and perfect performance. It includes all the features you need to create a professional music website easily and quickly. Customization features of the theme are numerous, so you can change its appearance and functions up to your needs. It’s especially simple with the help of WPBakery page builder integrated into it and useful for non-programmers. 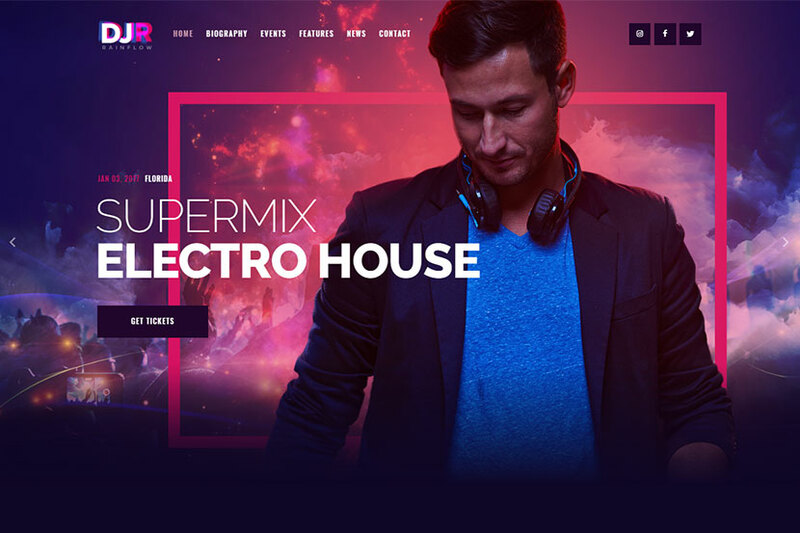 A modern and stylish WordPress theme suitable for night clubs, DJ parties, dance clubs, trance and house festivals, vinyl shops, music stores, musicians, disco clubs, etc. As the theme is compatible with WooCommerce, it is possible to sell music instruments, compact disks or any other products right from your website. 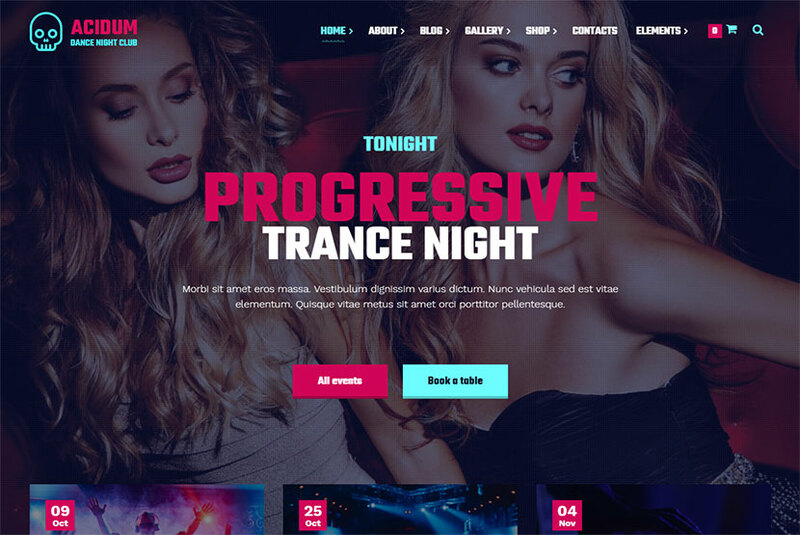 The features of the template include more than 20 unique shordcodes, WPBakery page builder integrated, and a lot of pre-made page layouts including galleries, blog, testimonials, products catalog, product page, about night club, order and others. A WordPress theme for music labels, bands, artists, musicians, DJs, producers, and of course for music lovers. It is made on clean and slick basis and with modern design. The theme includes audio player with playlists, events list, discography, photo gallery and other possibilities available with WPBakery page builder plugin integrated into the theme. It comes with both white and dark styles, anchor smooth scroll for one page sites, boxed and fullwidth page layouts, music player with continuous playback, Slider Revolution, and more features. A WordPress theme made for podcasting, music, DJs, music artists and audio websites. It includes Blubbry media statistics which allows to track the number of times your audio files have been downloaded. 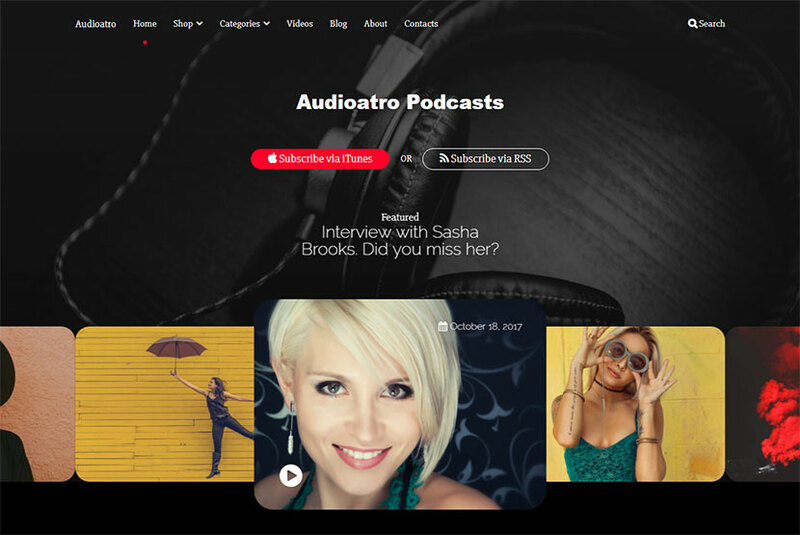 This theme is a perfect choice to give a podcasting, music or audio website a new modern look. Its features include WPBakery page builder integration, HTML5 audio visualization, PowerPress (podcasting plugin by Blubbry), Mailchimp newsletters, podcast presenters showcase, WooCommerce support for an online store, video and lyrics pages, and many more features. A professionally designed WordPress theme made for the music industry and suitable for bands, DJs, musicians, music producers, events or any other music related festival. It is also suited for creating an online portfolio to showcase your music art. The theme is easy to use and customize, it includes extensive theme options, image and photo gallery, sticky player and playlist, events calendar, infinite scroll, related posts, jetpack supported, beautiful typography, translation ready files for creating a multilingual website, mobile menu support, and many more features. 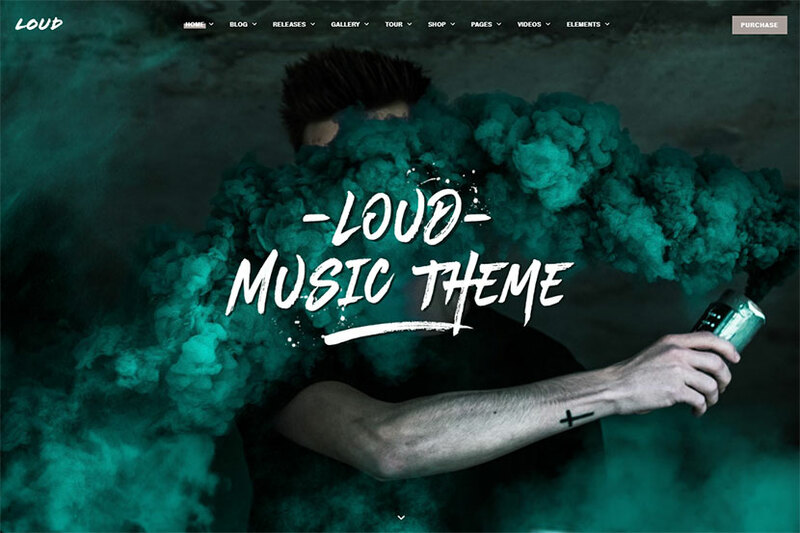 A modern WordPress theme suitable for any music band, musician, radio, club, DJ, as well as for online shop, blog or any other music-related website. 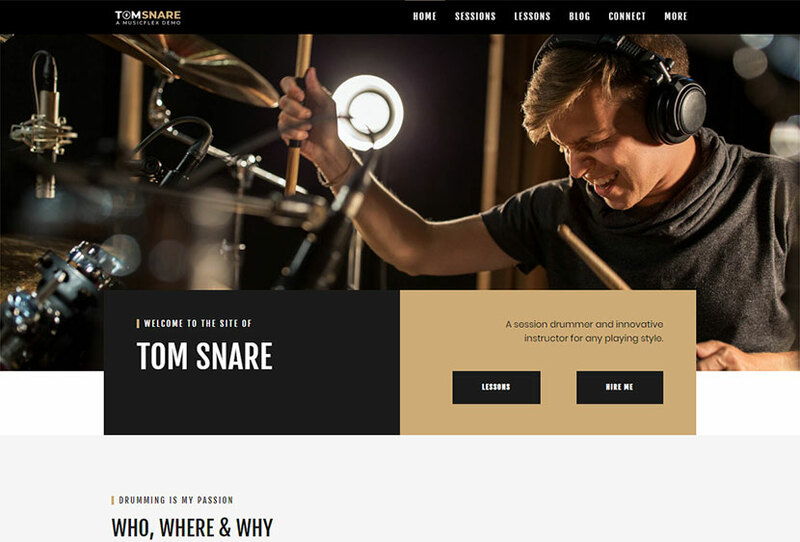 The template offers all essential music features for building a subject oriented website. They suppose event promotion, discography management, gallery management, and other possibilities. It includes 8+ unique homepage layouts, slideshow management, blogging and vlogging features, different post formats, unlimited design possibilities, and many more advantages. 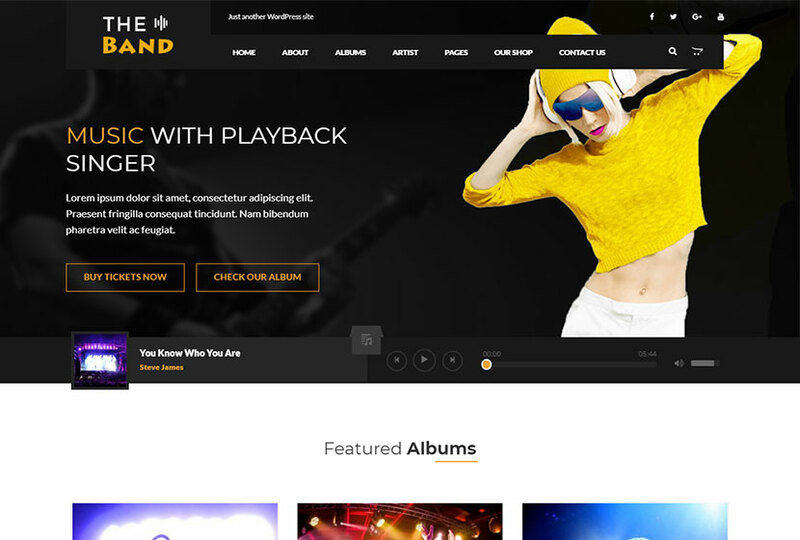 A WordPress theme best suitable for music bands, DJs, singers, artists, radio, events and entertainment websites. The theme includes 3 homepage layouts which you can use to provide information about upcoming events, showcase discography, etc. It also allows to showcase your photo and video galleries to announce of the event being held or which is about to come. Of course the template comes with a lot of layout features supposing boxed and fullwidth layouts, WPBakery page builder integration, advanced blog settings with flexible layout options, custom widgets and shortcodes, Revolution Slider, and many more opportunities for a user. A modern and clean WordPress theme crafted for musicians, artists, labels and everyone working in the entertainment and music industry. The most remarkable features of the theme include discography, tour dates, playlist manager, store, video & photo gallery, and more. It also comes with intuitive admin interface, unlimited layout possibilities, more than 200 template variations, tailored WPBakery page builder with a lot of additional elements dedicated to musicians, Slider Revolution with 10 demo sliders included, a big set of home page layouts, advanced playlist manager, and much more features. 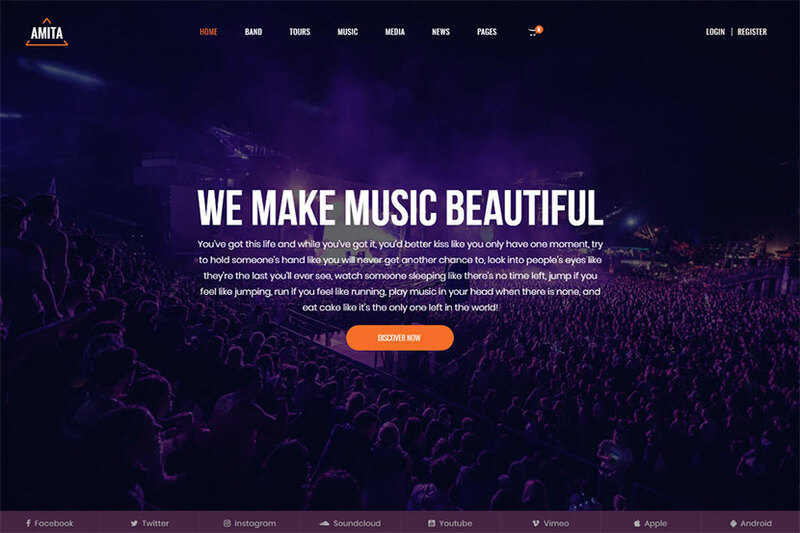 A great WP theme created for music events, bands, artists, or nightclubs. Its unique design will help you stand out from the crowd. 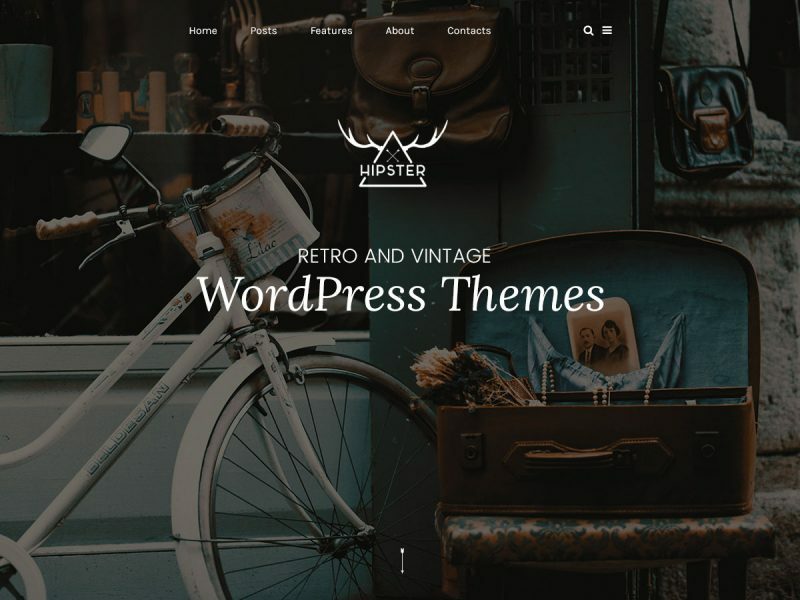 The theme comes with unlimited color variations, 3 home pages styles, black & white versions, a visual drag-n-drop page builder, unlimited Google fonts, Bootstrap 3 framework options, and WooCommerce support. This theme is a great choice for musicians and music bands to promote their creation, upcoming concerts, events, albums and tracks. The shopping functionality is available here to help you get the profit from selling your albums online. A podcasting WordPress theme that will become a great tool for podcasters who want to be present on the Web. It supports multiple podcasting plugins including PowerPress and SeriouslySimplePodcasting. The template is compatible with locally hosted or external MP3 files and embeds including SoundCloud, MixCloud, YouTube and more. It comes with dozens of design options and allows displaying your content in a unique and customized design. The theme supports the Elementor page builder with addons which allow to make the website building process as easily as possible. An awesome looking music WordPress theme suitable for artists, music bands, musicians or anyone working in show business and music industry. The theme comes with a full screen slider, responsive masonry archive layout, custom post types for discography, events, photo gallery and music albums. It also includes the intuitive WPBakery page builder plugin, grid system, pre-made page layouts for blog, events, team, album, shop, gallery, about, services, and more purposes; touch swipe support, and many more features are available. As most of the themes are WooCommerce compatible and come with a lot of features, they can serve both as your portfolio and a way to earn income by selling your music on the Web.